Saturday’s activities began bright and early at the annual Rinehart Foundation Alumni and Friends Recognition Breakfast, which honored outstanding alumni as well as the reunion classes celebrating 60, 50, 40 and 25 years in dentistry. 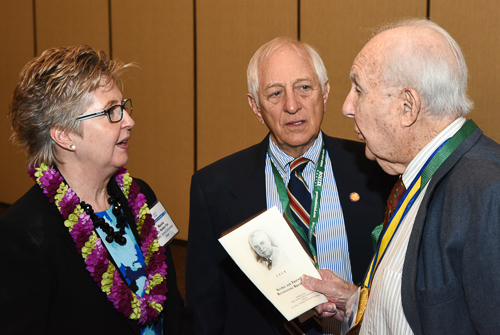 Milestones in individual giving were also recognized with the awarding of Rinehart Philanthropy Medallions and Benefactor Pins to milestone donors. The day’s Scientific Sessions featured hands-on workshops on “The Single Tooth Crown Solution” and “Stainless Steel Crowns,” as well as programs on topics that included lifestyle habits, ethics, anesthesia, and sports dentistry. Attendees also could wander over to the Technical Exhibits to learn about the latest developments in dental technology, materials and services. Photos from Saturday’s events. This entry was posted in Alumni, Events, Feature, News. Bookmark the permalink.